© Victoria & Albert Museum, London. Remarkably, the splendid costume in which the sitter is so meticulously depicted, has survived the centuries, and today is in the collection of the Victoria and Albert Museum, London. He is wearing one of the most resplendent costume pieces of this period and the silk doublet and breeches are virtuosically tailored with deep slashing on the doublet to reveal a layer of blue silk beneath. 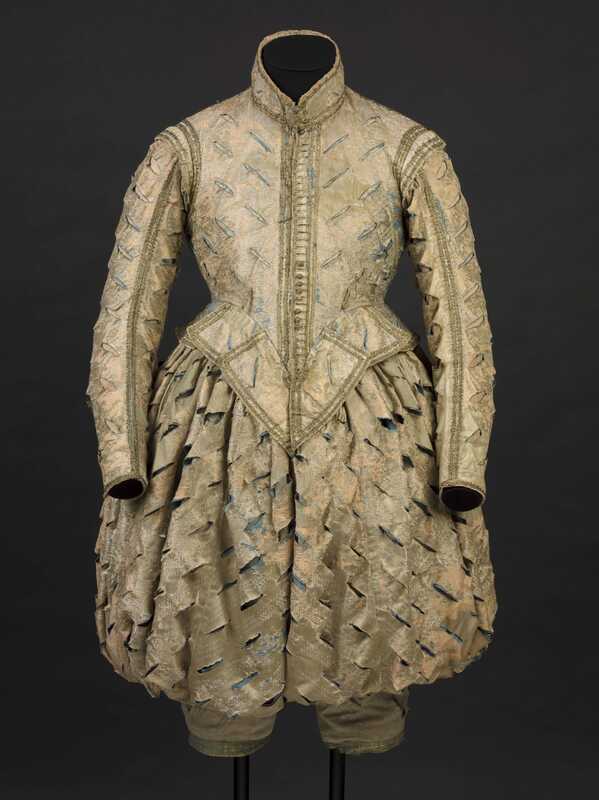 The costume is so exceptional that, not surprisingly, it was lovingly preserved by the Cotton family until it was gifted to the Victoria and Albert Museum by Lady Spickernell in 1938. Its magnificence is most likely due to the Cotton family’s background as merchant drapers in the City of London. Rowland would have been familiar with the wide range of fabrics and accessories on sale in the capital’s shops. The most expensive collection of shops with the most coveted fashionable goods were to be found in the Royal Exchange, in the City of London, close to the family home where he grew up. Private collection, Antwerp, until 2014. J. Arnold, Sir Richard Cotton’s Suit, The Burlington Magazine, 1973, vol. 115, pp. 326 - 329. S. North (ed. 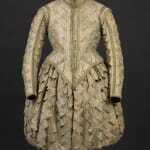 ), 17th-century Men's Dress Patterns: 1600 – 1630, London 2016, pp. 48 – 49, illus. 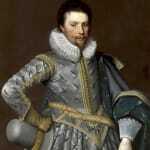 Sir Rowland Cotton (1577 – 1634) was an English politician who sat in the House of Commons at various times between 1605 and 1629. He was the eldest son of William Cotton, a rich and prominent member of the Drapers' Company of London, who lived at a house called the ‘Redde Logge’ in Canwicke Street in the City of London. The young Rowland had grown up in his father's house in London, matriculated at St John's College, Cambridge c.1596 and was admitted to Lincoln's Inn in June 1599. His father had two elder brothers, both of whom were childless, so when Rowland's uncles both died around 1606 and his father in April 1608, he inherited family property consisting of land in Shropshire and Staffordshire, primarily at Alkington in Whitchurch, the family seat, and Bellaport in the parish of Norton-in-Hales, where he himself chose to live. Whilst born and raised in London, Rowland did not follow his father into trade, being heir to the Bellaport family estates in reversion to his childless uncle John. 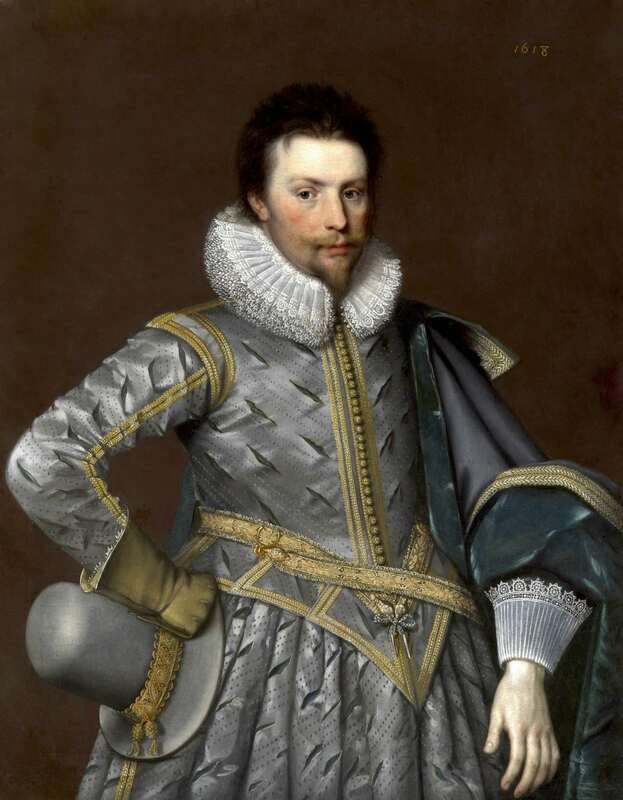 He married firstly Frances, the eldest daughter of Sir Robert Needham of Shavington Hall, five miles from Bellaport. The Needhams were the premier landowning family in Shropshire and this facilitated Rowland’s political career. He was adopted by the mayor and burgesses of Newcastle-under-Lyne as their prospective member, taking his seat in the parliament of 1605-10. Following this, he was drawn into Prince Henry’s circle, although not as a formal member of the Prince’s Household, and is recorded as having been in one of the Prince’s masques, possibly as Oberon. In 1608 his wife died and it was to his acquaintance, Inigo Jones, that Cotton turned for a design for her tomb which still stands in the remote church of St Chad at Norton-in-Hales, Shropshire. He married secondly Joyce, the daughter and co-heiress of Sir Richard Walsh of Sheldesley Walsh, Worcestershire. He died in August 1634 aged 53 and was buried in the parish church at Norton-in-Hales, beside his first wife. He left no children and his estates reverted to his brother William on the death of his wife. Frances Stackhouse Acton (1868) The Castle and Old mansions of Shropshire. (1868) Shrewsbury: Leake and Evans, p.38. R. Strong, Henry Prince of Wales and England’s Lost Renaissance, London, 1978. J. Newman, An early drawing by Inigo Jones and a monument in Shropshire, 1973, Burlington Magazine, vol. 115, no. 843, pp. 360 – 367. Sir Bernard Burke (1879), 6th ed., A Genealogical and Heraldic History of the Landed Gentry of Great Britain. Vol.1, p.375.